HTML Basic Structure, Elements in HTML, HTML Headlines, List in HTML, Insert Images in Web Pages, Tables in HTML, HTML form design, HTML5 Elements, HTML Canvas, etc. HTML stands for Hyper Text Markup Language, which is the most widely used language on Web to develop web pages. HTML is similar to SGML, although it is not a strict subset. HTML defines the structure and layout of a Web document by using a variety of tags and attributes. HTML is the beginning of everything you need to know to create beautiful web pages. You can start building your web site with HTML. 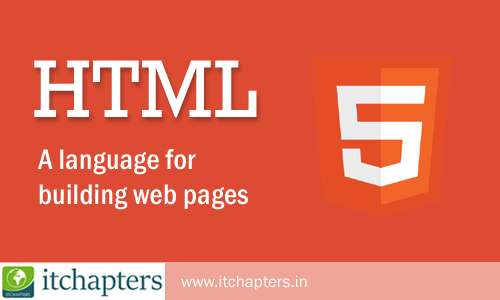 ITChapters tutorial teaches you everything about HTML and HTML5 in easy to learn method. HTML is the foundation of all web pages. Without HTML, you wouldn't be able to organize text or add images or videos to your web pages. What you learn in HTML? Here at ITChapters you will know all the common HTML tags used to structure web pages, the skeleton of all web sites. You can show data list, add images, add hyperlink for navigation of pages, tabular presentation of data, frames to show multiple files in same window, forms and its attributes design for business applications. You will be able to learn HTML5 and new Semantic Elements which is used to create Responsive Web Design that makes your web apges look good on all devices (desktops, tablets, and phones). You will be also able to learn HTML Canvas elements which is used to draw graphics. Finally you will learn examples at the end of every chapters.